Data input, editing of given (passcart). Automatic creation of a backup copy of the data. Restoration of the data from a backup copy. 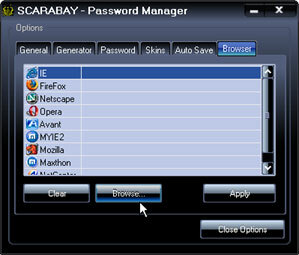 The same as the Windows login window, this Login window allows you to enter the password for logging into the account. So, you can create personal accounts to each member of your family or colleagues and employees. 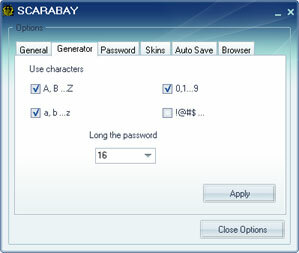 Login and password can consist of any combination A,B..,Z; a,b,..z;0,1,..,9; and be up to 16 characters in length. 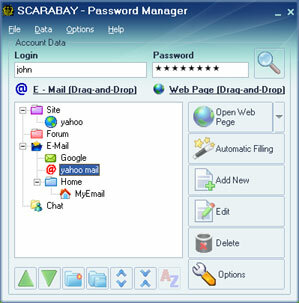 Multi-user working mode lets any member user save their personal data and passwords separately with unique settings. Switch between users quickly. So, personal accounts can be created for each member of your family. Creating new data. Edit Data. 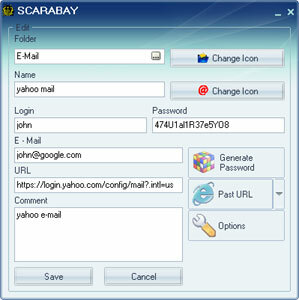 It stores any logins, passwords, E-Mails, URLs, and notes etc. in an encrypted encryption file. 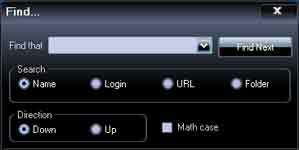 A specially developed algorithm is used for enciphering. Generates random passwords that hackers cannot guess. Avoids repeated and similar characters. Specification of characters (upper/lower letters, digital, special characters, etc.). 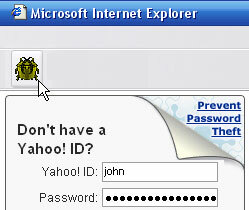 Use a reliable passwords consisting of a combination of the upper and lower case letters, numbers and other special characters. Passwords not containing a set of such elements are unreliable. A reliable password is Sc34R5fE. An unreliable password is My33. Use a reliable password you can remember without writing it down. 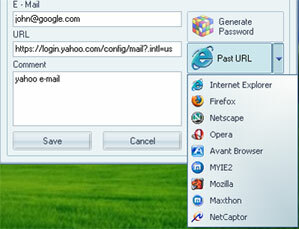 One click will remember URL webpage with a login and password. URL is taken from last open window of a browser. Or "drag-and-drop". 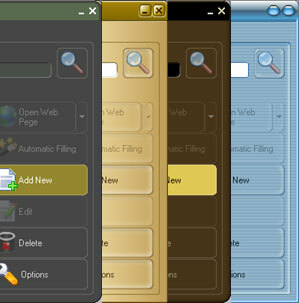 Navigate to your browser's login page with one click or drag-and-drop. 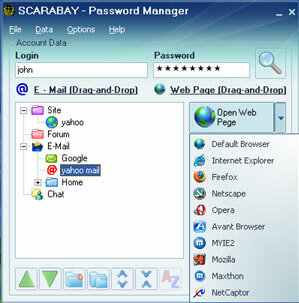 You can choose the following browsers for opening the login page: default, IE, FireFox, Netscape, Opera, Avant Browser, MyIE2, Mozilla, Maxthon, NetCaptor. 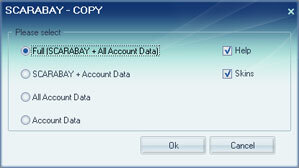 Copy program, database and auto backup data. 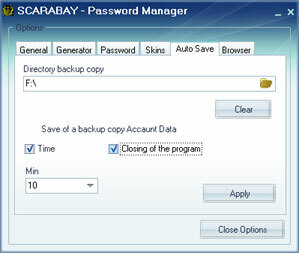 Automatically backup the password database. 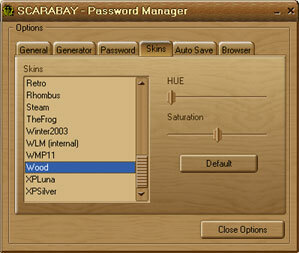 Auto save backs up the SCARABAY database on exiting the program or after a period of time. It can be advantageous to use function of auto save by choosing an area which is not on a system disk and there is no operational system. This will ensure that if the database is damaged it can always be restored. Search in a tree of the data in a name, login, the address, folder, match case and is added without. Both upwards on a tree, and downwards.